Here’s an interesting challenge from the website, “God Is Imaginary.” The main part I’d like you to focus on is the quote from Stephen Roberts. The rest of the challenge is there to provide context, but it’s the quote by Roberts that I’ve seen popping up in various atheists’ remarks. If you believe in God, you have chosen to reject Allah, Vishnu, Budda, Waheguru and all of the thousands of other gods that other people worship today…. In the same way, the followers of all these other religions have chosen to reject God. 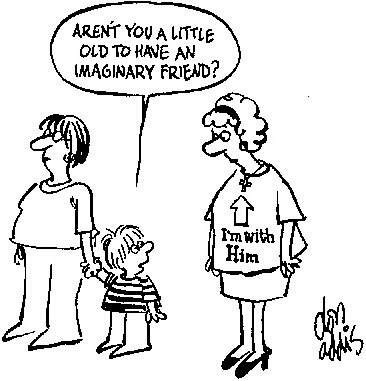 You think their gods are imaginary, and they think your God is imaginary. In other words, each religious person on earth today arbitrarily rejects thousands of gods as imaginary, many of which he/she has never even heard of, and arbitrarily chooses to “believe” in one of them. A rational person rejects all human gods equally, because all of them are equally imaginary. Are you really not that different from an atheist? Is the difference between his beliefs and yours merely “one fewer god”? Is his rejection of God the same as your rejection of all the other gods? Tell us what you think of this one. How would you respond? Brett will give us his thoughts on Thursday. The difference between Roberts’ understanding and my understanding is a matter of examining and then following the evidence, not merely arbitrarily choosing to believe in a god (as Roberts suggests). Because of the objective, historical, convincing evidence for the existence of the God of the Bible, it makes better sense and matches reality better to believe in the Bible’s God than to believe in no god (Roberts’ “one fewer god”) or to believe in other gods (Allah, Vishnu, etc.). Further, once your evidence-based, objective belief in the Bible’s God is reinforced by a subjective, personal experience with Him (which is impossible with no god or with the other gods), your rational belief strengthens to an even deeper relational level. Belief in the Bible’s God can start at the rational level and grow to the relational level, or vice-versa, but both elements (rational thinking and relational experience) are the bookends that hold our belief in the Bible’s God together…not mere arbitrary choice. Neither “bookend” exists for belief in other gods or for belief in no god. Roberts’ theory topples off the shelf. could you apply the suicide tactic here? The statement admits that one of still believes in at least one God which would confrim that one of us is not an anthiest. If he said this to me, I’d ask him, “Why do you think my belief in the Christian God is arbitrary?” He’s making an assumption as to why I believe in God, and I’d like to know what it is. First, I’d correct him by saying that I, personally, do look for evidential basis to believe what I believe. If he claims that I only believe because of where I was raised or what my parents taught me and that this makes the veracity of Christianity suspect, then he’d be committing the genetic fallacy. However, in the quote above he seems to be attacking a believer’s reasons for believing, not the actual veracity of the belief itself (though he gets into that later). Also, I’m not an atheist. I’m a theist. Do I deny Allah and Zeus? Sure, but that doesn’t make me an atheist, since I believe in a personal God. It does, however, make me a rival theist, since I accept one personal God and deny another. Also, I find the claim that “I just believe one less God than you” to be rather unremarkable. What follows from that? It’s exactly what separates me from the atheist. His last comment is that a reasonable person rejects all human God’s because they’re all equally imaginary, but he needs to provide reasons for thinking so. Yahweh is much different from Zeus and Aphrodite. Yahweh is even different from Allah. Why should I pigeonhole all gods in the same box? Saying, “The only difference between you and me is that I believe in one less God than you,” in my mind is like saying, “The only difference between being single and married is that I’m married to one less woman than you.” Uh……I suppose but that’s not an insignificant difference. It is by definition what makes us different. As always, I’d start this challenge by asking my challenger to clarify exactly what he means. It seems to me he thinks my belief in God is totally arbitrary. I have chosen it only because that’s what I was raised to believe in, or perhaps I just like Christianity better than other religions. But as Kyle just said, this is to commit the genetic fallacy and attack a person’s reasons for believing rather than dealing with the belief itself. However, I’d next point out that this accusation does nothing to attack the evidence that there is at least one God (the Kalaam Cosmological Argument, the Fine Tuning Argument, the Moral Argument, etc etc.). If I had only these arguments, I would at the very least be a Deist. So, since the evidence stipulates that their must be at least one God, I’m going to decide who that God is based on the evidence. From what I can see historically, scientifically, and through personal experience, Christianity does the best job of explaining the world we live in. My critic may disagree, but at the very least (assuming he is honest with himself) he would have to admit that my faith in God is not simply an arbitrary choice from many proposed gods. It simply does not follow that if many people believe in false gods, there cannot possibly be a true God. The assumptions in the challenge are laughable, and laughably wrong. No, I haven’t decided to reject the “gods” of other religions, and I don’t think they’re all imaginary. I’ve chosen to obey the God of Israel. I haven’t even heard of most of the others, but the ones I have heard of I consider very real — and very dangerous. This challenge really does not deserve a lengthy response; It’s just a misuse of the term “Atheist”. The definition of an Atheist is a person who makes the universal judgement “There is NO God”. A Theist, however, clearly disagrees with that statement. Because they believe that there is a God, they are in no sense an Atheist! One thing we should take note of though before dismissing this challenge altogether is that there is a serious misunderstanding here (aside from the misuse of terms) that the skeptic is assuming: namely that all Gods/gods are equally valid. You cannot dismiss every idea of God if just one proves to be implausible. The God of the Bible (Yaweh) is simply not like that. Arguments such as the Cosmologic, Teleological, and Moral arguments for God point us not only to God’s existence but also His character which stands in stark contrast to any other acclaimed celestial deity out there. His character is perfect. So, that’s one misunderstanding that would be healthy to point out for the skeptic and clear up. Overall, this is an Atheist line that is repeated on a popular level, yet provides no serious threat to Theism whatsoever. We are absolutely not all atheists. Bob,Tim, John, and Jimmy are in their room sleeping one night. Suddenly, they hear something scattering in the attic above the room. It runs back and forth, it hisses, it scratches on the wood. Bob believes it is cat. John says he thinks its a raccoon and a squirrel. Jimmy says he thinks its a herd of mice fighting with each other. However, they all agree something is up there. In the same way, all religions agree in a creative being. They believe something is in the attic. They simply disagree about the details. Atheism on the other hand, stands outside that circle of agreement, and claims there is nothing to detail.He can’t even enter the discussion of numbers because he believes there is nothing to be numbered. There is simply a enormous difference between there be something and nothing. Everyone has a ‘god’ even if they don’t call it a ‘god’. For some people their spouse might be their ‘god’. For others money might be their ‘god’. Some people might even live as though science is their ‘god’. Or (heaven forbid) the self might act as ‘god’. So everyone has a ‘god’ and rejects the millions of things that other people see as ‘god’ in their lives. I can’t disprove the existence of God simply because people are trying to find meaning in their lives in many different places. And I can’t ‘prove’ the existence of God simply because He is the best ‘option’. Saying that I can ‘choose’ between all these ‘gods’ or ‘choose’ none of these ‘gods’ assumes that I somehow have a corner on the Truth market and have the ability to make that decision. Humanity has a disposition against Truth and requires a God who searches us out to show us Truth. And there is only one God who does this and has personally intersected humanity throughout history. The God I follow is not the one that I have to find, but the One who found me. What do they mean by “arbitrarily”? This kind of ties back in to my earlier point: Do people really reject thousands of possible gods on a whim? Or are there honestly thoughtful people out there who have plausible reasons for their belief/disbelief? I think it comes down to a question of “what criteria are you using to accept or reject these possible gods?”. Ok, sure. Youre one God less than me. Still a huge difference. Also, I reject other religions because I believe Christianity is true. I can have some very similar worldviews as other theists. But you, mr atheist sir, reject Gods for entirely different reasons. You reject gods for metaphysical reasons, you may believe nothing other than physical stuff exists. I dont hold that view, and thats is not why i reject other beliefs. Or, put another way: If you believe that 1+2=3 you reject that 1+2=2, 1+2=12, and 1+2=11(base 10). Since I have rejected 1+2=3, I therefore classify your rejection of 2, 12, and 11 as arbitrary.